Marshall County 4-Hers Kordell Feldhaus and Weston Henschell add paper to the heap in their recycling trailer. Photo by Troy McQuillen. The paper recycling project in Marshall County started through the work of Patty Ogren in Langford. She had tried to get a large recycling trailer in Langford, but she realized they wouldn’t have enough volume to make it worthwhile. By working with the Britton groups, however, they did. They have now been recycling for about two years. So far 186,240 pounds have been recycled, and Marshall County 4-H has received $4,531 that has gone to support Marshall County 4-H programs and the Strand Theatre digital projector campaign. 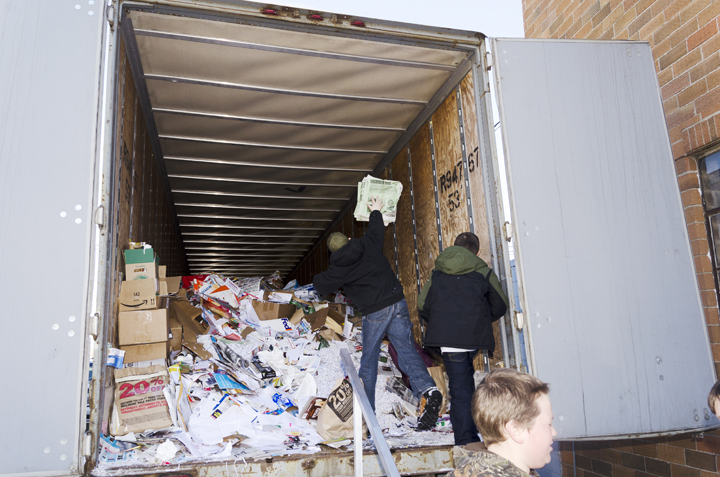 “The 4-H families and volunteers who donate their time to maintaining the trailers are to be commended, as are the people who collect and drop off their paper at either trailer,” said Jennifer Ringkob, 4-H youth program advisor in Marshall County. Langford has its own side project for the recycling effort: A small trailer parked in town holds the paper before it is hauled to the larger trailer in Britton. That smaller trailer was purchased through group fundraising efforts, including a grant that Langford student Kristen Erickson received from the Hershey Foundation. The group sees this as a good place to start recycling in the community, since it has such a clear benefit. They hope to add recycling for other items someday, even if those efforts may have a cost attached.